To the artists of eighteenth-century Europe, it was not enough to simply paint a beautiful painting. Yes one could marvel at your use of colors, proportions, and how masterfully you draped the fabric on your figures, but this was just not enough. The story that is represented must also improve the viewer and impart a moralizing message. This was a common theme even before the emergence of the Neoclassical trend (for example, Chardin’s canvases of simple French country life or Hogarth’s painted commentaries on the wealthy classes of England). When interest in the ancient cultures of the Mediterranean—more specifically Rome—arose in the mid eighteenth century the moralizing theme segued to also include stories from classical antiquity. The Swiss-born painter Angelica Kauffmann is just one artist to contribute to this genre. Painted in 1785, Cornelia, Mother of the Gracchi, Pointing to Her Children as Her Treasures, is her subject. Roman architectural influences frame two women portrayed wearing what one can imagine is typical of ancient Roman dress, along with three children, also wearing masterfully draped togas with thin leather sandals. They look like they might have stepped directly off a temple’s pediment. If you compare Kauffmann’s simple presentation to the previous Rococo genre, with the lush landscapes, frothy pastel pink frocks, and chubby frolicking cherubs, it is clear that art is going in a different direction. This painting is an exemplum virtutis, or a model of virtue. The story that Kauffmann painted is that of Cornelia, an ancient Roman woman who was the mother of the future political leaders Tiberius and Gaius Gracchus. The brothers Gracchi were politicians in second-century B.C.E. Rome. 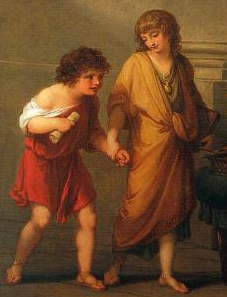 They sought social reform and were seen as friends to the average Roman citizen. So where did these benefactors of the people learn their exemplary ethics? That would be their mother, Cornelia. 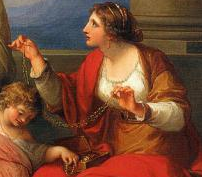 The scene that we see in Kauffmann’s painting illustrates one such example of Cornelia’s teachings. A visitor has come to her home to show off a wonderful array of jewelry and precious gems, what one might call treasures. To her visitor’s chagrin, when she asks Cornelia to reveal her treasures she humbly brings her children forward, instead of running to get her own jewelry box. The message is clear; the most precious treasures of any woman are not material possessions, but the children who are our future. You can almost feel the embarrassment when you look at the face of the visitor, who Kauffmann has smartly painted with a furrowed brow and slightly gaped mouth. 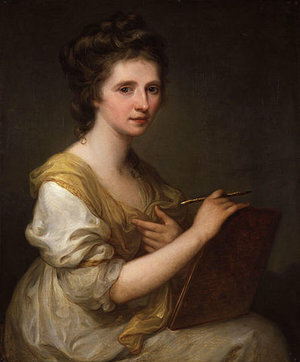 Born in 1740, Angelica Kauffmann received a first-rate artistic education from her father, who was a Swiss muralist. She traveled through her native Switzerland, Austria, and eventually Italy where she was able to see the work of the ancient artists with her own eyes. She was following in the tradition of the Grand Tour, the educational excursion that many wealthy Europeans took to marvel and study the art, architecture, and history of ancient Rome. The interest in ancient Mediterranean cultures was fueled not just by the cultural productions of Rome, but also by the newly discovered remains of the ancient Roman cities of Herculaneum and Pompeii, which were excavated beginning in 1738 and 1748, respectively. Covered by the volcanic ash of Mount Vesuvius in August 79 CE, an almost perfect scene of typical ancient life was preserved. These findings did not just spark a renewed interest in classical antiquity in eighteenth-century art and architecture, but also inspired new fashions, interior design, and even gardens and tableware. This was a find that one must see in person, and Angelica Kauffman was lucky enough to take the Grand Tour like so many of her fellow artists. While the geometric symmetry and simplicity of the arts in antiquity might have greatly inspired the work of Kauffman and other Neoclassical artists, these ancient societies also aligned with Enlightenment ideals, which were often seen as the zenith of human civilization. Greece and Rome—it was felt—were the cultures that gave us the enlightened political systems of democracy and republicanism, as opposed to the modern monarchies, which would be increasingly criticized as corrupt and arbitrary in the mid and late eighteenth century. The ancients could instruct modern audiences in patriotism, civic virtue, and ethics, and Kauffmann’s moralizing message is a wonderful example of this trend. This revival of classical antiquity was a cultural phenomenon that affected not just artistic practices, but also shaped the modern mind. Angelica Kauffman would eventually settle in England where she enjoyed great success as a portrait artist and history painter. In an age that can be described as patriarchal at its best and chauvinistic at its worst, Kauffmann played a major role in the British art scene. She was a regular exhibitor at the prestigious Royal Academy and had many aristocratic and even royal patrons. 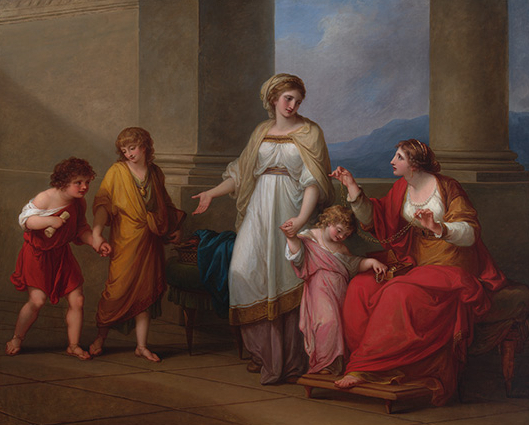 Cornelia Pointing to Her Children as Her Treasures is truly one of Kauffmann’s most famous treasures, and permanently positioned her as a pioneer of the Neoclassical movement. Cite this page as: Dana Martin, "Angelica Kauffmann, Cornelia Pointing to her Children as Her Treasures," in Smarthistory, January 7, 2016, accessed April 20, 2019, https://smarthistory.org/angelica-kauffmann-cornelia-pointing-to-her-children-as-her-treasures/.